Are you worried about your GERD? If you worry that your GERD may have advanced into Barrett’s Esophagus, precancerous cells in your esophagus or even esophageal cancer, you will want to have an examination of your esophagus. How have examinations of the esophagus changed? Cellvizio is the world’s smallest medical microscope and can view cellular details during a standard endoscopy performed by a gastroenterologist. Cellvizio can be guided to hard-to-reach areas within the body. It’s designed to be minimally invasive, so a patient can have the procedure on an outpatient basis. The American Society of General Surgeons has recently endorsed the use of Cellvizio endomicroscopy in patients suffering from GERD and/or Barrett’s Esophagus, following the recommendations of the American Gastroenterological Association and the College of American Pathologists. How does the world’s smallest microscope improve exams? The old way was to remove a sample of tissue and send it to the lab for a diagnosis. The new technology is to bring the lab and microscope into the patient, enabling a faster and more accurate diagnosis. 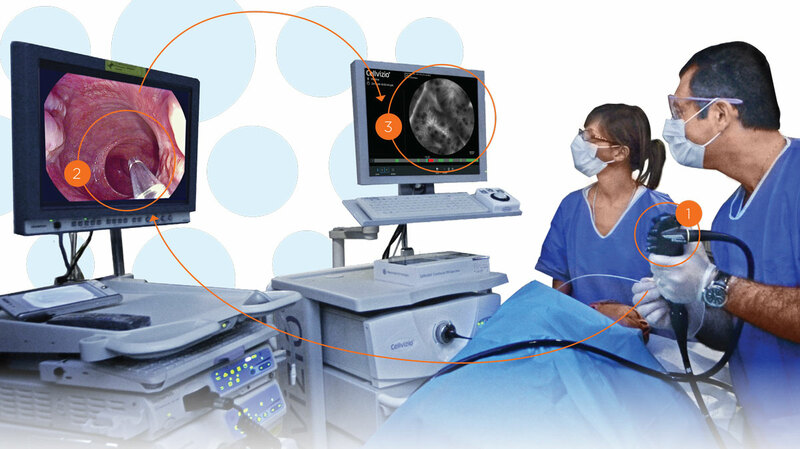 The Cellvizio miniprobe is placed into contact with your cells, allowing your doctor to see the tissue instantaneously at a microscopic level, and generating a video that is displayed in real time. The images taken are made available to your physician. What are the benefits to Cellvizio? Contact us if you’re concerned about the possibilities of GERD/chronic acid reflux, Barrett’s Esophagus or any related digestive/gastrointestinal issues you may have.